One of the reasons I’ve retreated from Twitter since May of last year is the rise of angry politics. I can’t pay attention to everything that’s happening all of the time. And I certainly haven’t got the energy to deal with problems that aren’t materially affecting me or the people I care about. Brexit, then, is a strange one. On the one hand, I participated in a democratic election to elect a government. Subsequently, a government formed from a party I didn’t vote for called a referendum on the United Kingdom’s membership of the European Union. As we all know, the result was close, and based on lies and illegal funding. Nevertheless, perhaps as a citizen I should participate democratically and then get on with my own life. On the other hand of course, this isn’t politics as usual. There’s been a rise in nationalistic fervour that we haven’t seen since the 1930s. It’s alarming, particularly at a time when smartphones, social media, and the ever-increasing speed of the news cycle make it difficult for citizens to pay sustained attention to anything. This article in The New York Times zooms out from the particular issues of Trump and Brexit to look at the wider picture. It’s not mentioned specifically in the article, but documentary evidence of struggles around political power and sovereignty goes back at leats to the Magna Carta in England. One way of looking at that is that King John was the Donald Trump of his time, so the barons took power from him. It’s easy to stand for the opposite of something: you don’t have to do any of the work. All that’s necessary is to point out problems, flaws, and issues with the the person, organisation, or concept that you’re attacking. So demagogues and iconoclasts such as Boris Johnson and Donald Trump, whose lack of a coherent position wouldn’t work at any other time, all of a sudden gain credibility in times of upheaval. Like so many political metaphors, the distinction between “hard” and “soft” is misleading. Any Brexiteer wanting to perform machismo will reach for the “hard” option. But as has become increasingly plain over the past two years, and especially over recent weeks, nobody has any idea what “hard” Brexit actually means in policy terms. It is not so much hard as abstract. “Soft” Brexit might sound weak or halfhearted, but it is also the only policy proposal that might actually work. What appear on the surface to be policy disputes over Britain’s relationship with Brussels are actually fundamental conflicts regarding the very nature of political power. In this, the arguments underway inside Britain’s Conservative Party speak of a deeper rift within liberal democracies today, which shows no sign of healing. In conceptual terms, this is a conflict between those who are sympathetic to government and those striving to reassert sovereignty. I’m writing this on the train home from London. 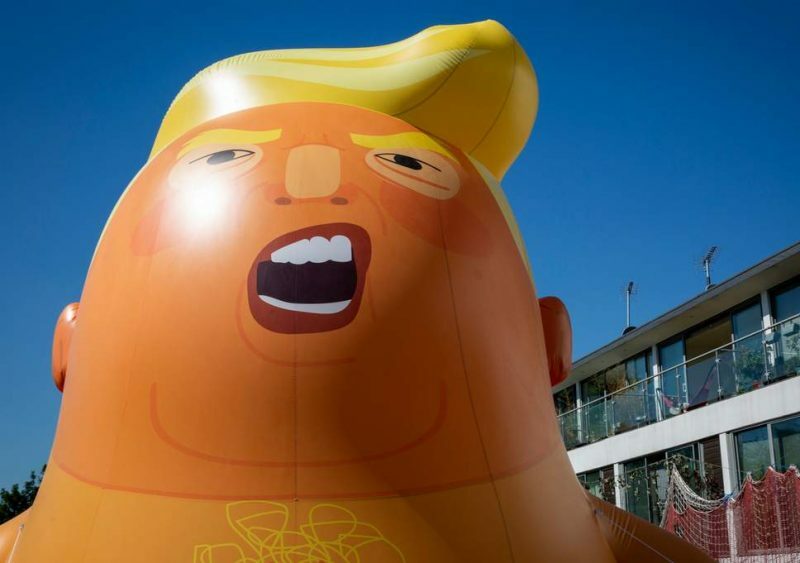 I haven’t participated in or seen any of the protests around Trump’s visit to the UK. I have, however, seen plenty of people holding placards and banners, obviously on their way to, or from, a rally. My concern about getting angry in bite-sized chunks on Twitter or reducing your issues with someone like Trump or Johnson to a placard is that you’re playing them at their own game. They’ll win. They thrive on the oxygen of attention. Cut it off and they’ll whither and be forced to slink off to whatever hole they originally crawled from. The more extreme fringes of British conservatism have now reached the point that American conservatives first arrived at during the Clinton administration: They are seeking to undermine the very possibility of workable government. For hard-liners such as Jacob Rees-Mogg, it is an article of faith that Britain’s Treasury Department, the Bank of England and Downing Street itself are now conspiring to deny Britain its sovereignty. What we’re talking about here is ideology. There’s always been a fundamental difference between the left and the right of politics in a way that’s understood enough not to get into here. But issues around sovereignty, nationalism, and self-determinism actually cut across the traditional political spectrum. That’s why, for example, Jeremy Corbyn, leader of the British Labour Party, can oppose the EU for vastly different reasons to Jacob Rees-Mogg, arch-Brexiteer. I haven’t got the energy to go into it here, but to me the crisis in confidence in expertise comes from a warping of the meritocratic system that was supposed to emancipate the working class, break down class structures, and bring forth a fairer society. What’s actually happened is that the political elites have joined with the wealthy to own the means of cultural reproduction. As a result, no-one now seems to trust them. What happens if sections of the news media, the political classes and the public insist that only sovereignty matters and that the complexities of governing are a lie invented by liberal elites? For one thing, it gives rise to celebrity populists, personified by Mr. Trump, whose inability to engage patiently or intelligently with policy issues makes it possible to sustain the fantasy that governing is simple. What Mr. Johnson terms the “method” in Mr. Trump’s “madness” is a refusal to listen to inconvenient evidence, of the sort provided by officials and experts. There have been many calls within my lifetime for a ‘new politics’. It’s nearly always a futile project, and just means a changing of the faces on our screens while the political elite continue their machinations. I’m not super-hopeful, but I do perhaps wonder whether our new-found connectedness, if mediated by decentralised technologies, could change that?